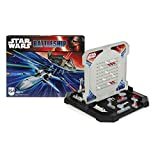 The Battleship puzzle (also called Bimaru, Solitaire Battleships or Battleship Solitaire) is a logic puzzle based on the Battleship guessing game. It is single player a single player version of the Battleship game. Using pure logic and requiring no math to solve, these addictive puzzles offer endless fun and intellectual entertainment to puzzle fans of all skills and ages. 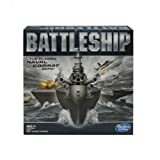 Battleship Solitaire was invented in Argentina in 1982 under the name Batalla Naval (Navy Battle). The first puzzles were appearing in the november 1982 issue of the Spanish puzzle magazine Humor & Juegos. Authorship is usually credited to the puzzler Jaime Poniachik who founded Humor & Juegos as an editor in 1980. According to Poniachik, the Battleship puzzle was born through team effort with Eduardo Abel Gimenez, Jorge Varlotta, and Daniel Samoilovich. Battleship puzzles made their international debut in the first World Puzzle Championship which took place in New York in 1992. In 1993 Games Magazine introduced Classic Battleship puzzles to their readers, with Peter Gordon and Mike Shenk hosting a Battleships column. Since then, Battleship puzzles have been included in almost all issues of Games and Games World of Puzzles. 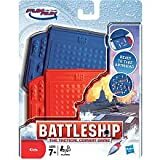 Battleships Puzzles exist in several grid sizes and offer endless solving variations, ranging from very easy to extremely difficult and taking anything from 5 minutes to 3 hours to solve. A typical Battleship puzzle consists of a 10x10 grid containing a hidden fleet of 10 known ships. The only available information are numbers telling how many ship segments are in each row and column, and some given ship segments in various places in the grid. The object is to discover where all ten ships are located in the grid. The ships may be oriented horizontally and/or vertically in the grid, but not diagonally. Ships can not occupy adjacent grid squares, even diagonally. In nearly all Battleships puzzles, the contents of a few of the squares have been revealed to start you off. This square contains no ship. This square consists of a submarine and must be surrounded by water. This square can be oriented in any of four directions. It indicates the end of either a destroyer, cruiser, or battleship. The square adjacent to the flat side must be occupied by a ship segment. All other surrounding squares are filled with water. This is either the middle segment of a cruiser, or one of the 2 middle segments of the battleship and the diagonally adjacent squares are filled with water. Fill in what you know in squares adjacent to given ship segments. Fill in water in rows and columns that have all of the ship segments already in place. Fill in ship segments in rows and columns that must have all of their remaining empty spaces filled in order to equal the corresponding number. Let’s start with the puzzle below which contains three given ship segments and two given water segments. Since submarines consist of one segment, all neighboring squares of H8 must be filled with water by marking them with an X. Square C4 contains the end segment of a ship, which means there is another part of the ship in C5. Since the count of row C is two, this ship must be a destroyer. We can now place the other end segment and fill the ten squares surrounding the destroyer with water by marking them with an X. Square F10 is a middle segment of a ship so it must be part of a battleship or a cruiser and must be oriented vertically because it is touching the frame of the gird. Therefore the squares above and below are ship segments (denoted by dots) and three more squares are filled with water. This technique helps complete rows and columns where ship segment counts are fully accounted for. Row A and columns 2 and 7 have counts of 0 meaning they contain no ship segments so all squares are marked with X to indicate water. Row C has a count of 2 which is accounted for in C4 and C5 so the remaining squares are marked with X. And finally, row F and columns 4 and 5 all have a count of 1 which is accounted for so the remaining squares are also marked with X. This technique helps find rows and columns whose remaining empty squares contain ship segments. Let's look at column 3 which has a count of 4. Since there are exactly four empty squares, all of them must contain a ship segment. This means a submarine must be placed in E3 and a cruiser in h2, I3, and J3. We can now go back and use basic technique 2 in row E to mark the remaining squares with X.